Every wedding venue is very different. Has a wedding photographer, in this case here in Hilton Head, Sc, while you have to concentrate on so many different aspect of how you are going to tell the story, clients are always going to want their day documented properly. Because they will almost in most cases not remember, most of the details, only later threw your eyes as a wedding photographer will they remember everything about their special day. So having a great timeline is one thing, capturing them with friends is another. However, I always look to create those different images. For this wedding at Rose Hill Plantation, in Hilton Head, South Carolina, they had a beautiful reception, with over 200 guest. As I walked away from the reception, I knew I could represent that in one image, by being photographed properly would showcase that. I always, always, bring to much equipment, but I believe in the golden rule that your better safe then sorry, especially as a wedding photographer more is always better. I have never, ever found myself missing any of my tools for any wedding. I put my camera and lens on my awesome Gitzo carbon fiber tripod, measure the light properly, and captured this image. 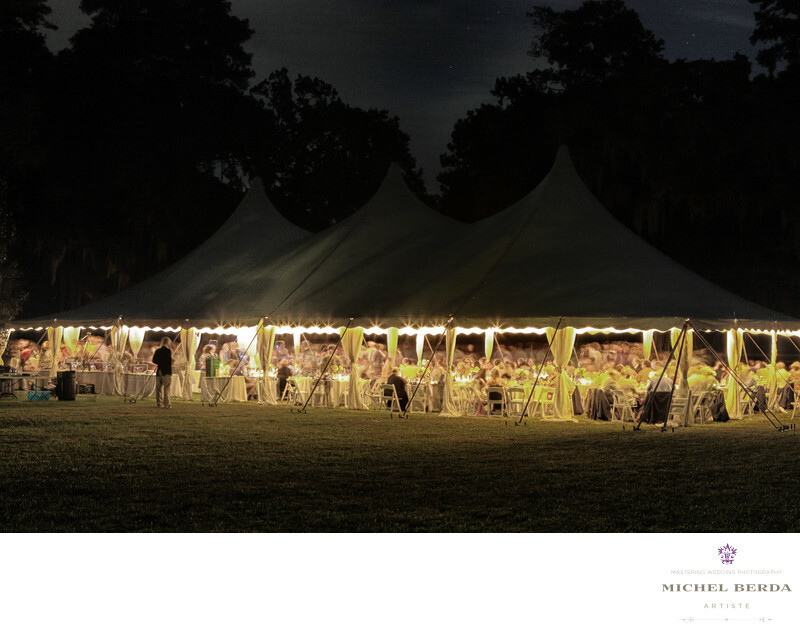 Instead of the sky behind the tent being pitch black, I allowed the meter to measure the light properly to give it that gray factor that I think for this image at Rose Hill Plantation, in Hilton Head, Sc, give it that wow factor you can see the trees in the back giving this image a true meaning of how large this wedding reception was but the key to all of this is how exquisite the images showcases that. Keywords: Destination Wedding Photographer (117), Hilton Head (75), Rose Hill Plantation (6), Rose Hill Plantation Hilton Head Sc (6), Rose Hill Plantation in HHI Weddings (6), Rose Hill Plantation Wedding (6), Rose Hill Plantation Wedding in Hilton Head Sc (6), sc (309), Wedding photographer In Hilton Head (66), Wedding Photographers (198), Wedding Photography (123), Weddings (168).